Original construction of the wagon road was relatively simple. With a little luck and a lot of sweat, the ten foot wide path only needed the removal of a few large rocks and trees. By the turn of the twentieth century the road was improved to haul supplies and passengers more efficiently. 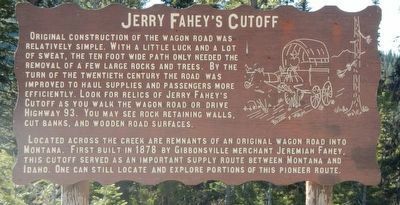 Look for relics of Jerry Fahey’s Cutoff as you walk the wagon road or drive Highway 93. You may see rock retaining walls, cut banks, and wooden road surfaces. 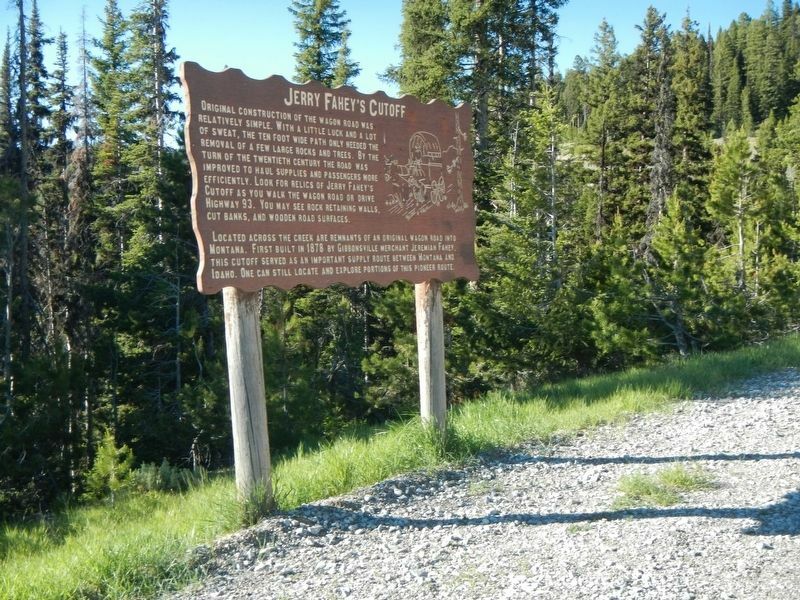 Located across the creek are remnants of an original wagon road into Montana. First built in 1878 by Gibbonsville merchant Jeremiah Fahey. This cutoff served as an important supply route between Montana and Idaho. One can still locate and explore portions of this pioneer route. Location. 45° 40.988′ N, 113° 56.661′ W. Marker is near Gibbonsville, Idaho, in Lemhi County. Marker is on Casey Road (U.S. 93 at milepost 349) near State Highway 43, on the left when traveling north. Touch for map. Marker is in this post office area: Gibbonsville ID 83463, United States of America. Touch for directions. as the crow flies. Lost Trail Pass (within shouting distance of this marker); Which Way Did Lewis & Clark Go? (approx. ¾ mile away in Montana); Lewis and Clark (approx. 2.2 miles away); Deep Creek (approx. 6.3 miles away); Natural Travel Corridor (approx. 6.6 miles away in Montana); A Story of Fires... to be continued (approx. 8.2 miles away in Montana); Gibbonsville (approx. 9.7 miles away); Join the Voyage of Discovery (approx. 10.7 miles away in Montana). Touch for a list and map of all markers in Gibbonsville. More. Search the internet for Jerry Fahey’s Cutoff. Credits. This page was last revised on November 5, 2017. This page originally submitted on November 5, 2017, by Barry Swackhamer of San Jose, California. This page has been viewed 84 times since then and 10 times this year. Photos: 1, 2. submitted on November 5, 2017, by Barry Swackhamer of San Jose, California.